A number of Birmingham's Labour MPs are calling for the UK to leave the European Union, while Tories in the wider West Midlands also back "Brexit"
The West Midlands is emerging as a Eurosceptic heartland, as the referendum battle begins in earnest. David Cameron has been busy in Brussels drumming up support for his European Union reform demands, ahead of a key summit of European leaders. And a deal could be confirmed as soon as Friday if all goes well for the Prime Minister - kicking of the referendum battle, although there will still be months to go before the nation votes on whether to quit the EU, probably in June. 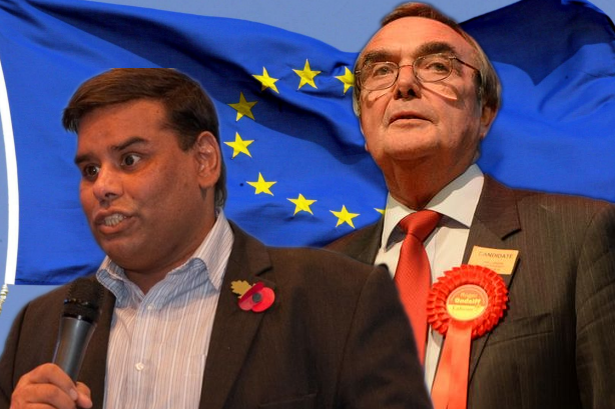 Nationally, 213 of Labour’s 230 MPs have signed up to a pro-EU “Labour In” campaign. But exceptions include Birmingham Hall Green MP Roger Godsiff, who is one of the leaders of “Labour Leave”, which is supporting calls for Britain to get out. Khalid Mahmood, Labour MP for Birmingham Perry Barr, is also supporting the leave campaign. He is trying to convince ethnic minority voters to join the fight, arguing that leaving the EU would let the UK build stronger links with its Commonwealth partners. And Gisela Stuart , Labour MP for Edgbaston, is a long-standing critic of the EU, although she has yet to confirm which way she will vote in the referendum. Like many MPs, she says she is waiting to see exactly what David Cameron achieves in his negotiations with other EU leaders. At the same time, she’s said she’s not impressed with the measures that appear to be on the table. There will be little surprise if Mrs Stuart eventually announces she’s backing the “leave” campaign. Birmingham’s only Conservative MP, Andrew Mitchell , who represents Sutton Coldfield, is also waiting to see what the Prime Minister comes up with. He may eventually decide that he’s in favour of staying in the EU, but it won’t be with much enthusiasm. One of the difficulties for David Cameron is that he’s placed so much focus on his attempt to renegotiate the terms of the UK’s EU membership, and achieved so little. It makes it hard for even EU supporters to summon up much enthusiasm. Outside of Birmingham, there are some prominent Conservative Eurosceptics. They include Lichfield MP Michael Fabricant, who argues that leaving the EU would help the UK trade with countries such as the US. North Shropshire MP Owen Paterson, a former Environment Secretary, argues that the UK should leave. Bromsgrove MP Sajid Javid, the Business Secretary, has been very critical of the EU in the past but it remains to be seen which way he will jump. His intentions are the subject of intense speculation at Westminster. However, he’s a friend and ally of George Osborne , the Chancellor, who will support the campaign for the UK to remain in the EU, and it seems unlikely that he will want to be on the opposite of the argument. There are also some enthusiastic supporters of EU membership among Midland Conservatives. They include Meriden MP Caroline Spelman, a former Environment Secretary, and Stourbridge MP Margot James. The “stay” campaign could hardly have asked for a better start - when they received a surprise endorsement from Prince William . Whether the Duke of Cambridge really meant to intervene in the EU battle is unclear. It’s possible he’s had some angry words with his speechwriters. But he appeared to back calls to stay when he spoke about the UK’s “long and proud tradition of seeking out allies and partners” in a speech on Tuesday. The Duke of Cambridge at the Foreign and Commonwealth Office in London where he made a speech seen as supporting EU membership. Mr Cameron is attempting to convince prime ministers, presidents and other leaders of EU member states to support his calls for EU reform at a two-day meeting of the European Council. Measures to be discussed include the so-called “emergency brake”, which limits the in-work benefits EU migrants can receive for the first four years they work here. If Mr Cameron gets his deal then he will hold a meeting of his Cabinet on Friday evening - allowing members of his government to come out publicly for or against membership of the EU. Business leaders from across Europe have urged the British people to vote to stay in the European Union, and are likely to do so repeatedly until the referendum is over. There are four parts to the deal Mr Cameron hopes fellow EU leaders will agree to. He wants the UK to be allowed to opt out of the EU’s goal of forging an “ever closer union”; a guarantee that there can be no discrimination against countries such as the UK which decline to join the Euro single currency, and an end to remaining trade barriers. The fourth demand is measures to make it harder for EU migrants who want to claim tax credits and other in-work benefits. But even if all these demands are met, will it be enough to convince British voters to stay in? Nobody knows how the public will react when given a choice about the EU for, in most cases, the first time in their lives, least of all David Cameron.